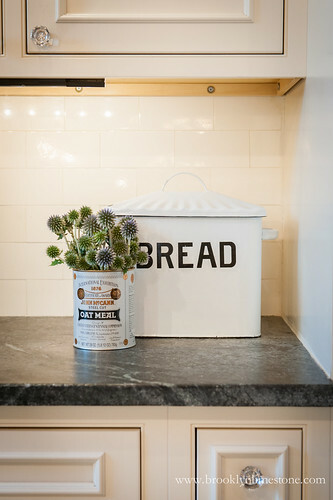 There are many things to consider when renovating a kitchen, and white kitchen cabinets were one of the best decisions we made. Hard to believe we have been living here for more than 7 years post renovation - time really does fly. Certainly, the room that got the most money and deliberation was the kitchen. It seemed like as good of a time as any to do a look back on how the most used room in the house is holding up. Want to see more of the transformation? 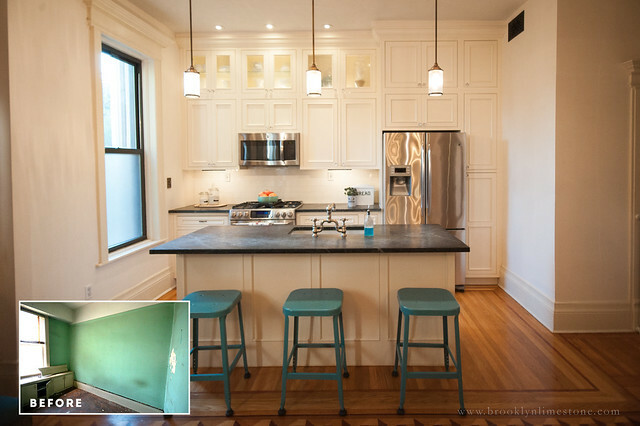 Check out the original kitchen before, during and after post. I think you'll agree that white kitchen cabinets were the right choice for bringing more light into the space. So here is a short review of each key element in our Kitchen Renovation along with a quick 5 ☆ review. I think that covers it but feel free to ask about anything I've missed. Still as beautiful as it was 7 years ago - true test of a great design! Love it!! I'm so glad it helpful. Yes, definitely go with a microwave you can hide or more easily swap out. The downside is that you lose a bit of shelf space but knowing what I know now, it would have been worth it. Perfectly classic. I predict you will love it still in 7 more years. I hate our farmhouse sink. It was here when we bought our home and not worth the hassle of switching out unless we renovate, but I truly can't stand it, It's huge and I don't need that much sink, I really don't. Takes forever to fill, bottom isn't flat, etc etc etc. If we ever do renovate, I will be getting your faucet for sure, and maybe your soapstone counters. Gorgeous. I've always loved your kitchen and still do. Your kitchen is timeless so the choices were great! on a diff. note can you share the community website you used to purchase the jenny lind bed earlier this year ? Thanks! The local group that I found the bed on (or I should say several readers alerted me to it) is Park Slope Parents classified. I believe you have to be a member to join but I could be wrong. Your kitchen is beautiful - I love that you revisited it. I had a non-stainless farmhouse sink in our last house and am going back to stainless. It's just simpler to take care of - but I do love your sink. 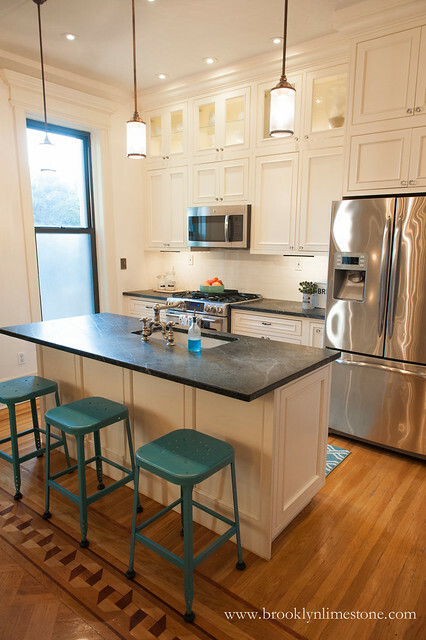 And, GAH, those countertops are the things of my dreams. For your cabinets, I'm happy to hear you haven't had chipping or anything? We're going with custom-built painted cabinets and I was concerned about wear over time. I don't think I would change one thing! Thanks! So much sweat went into this, so it's a good thing! Thanks Anne. Really sweet of you to comment. Oh doh..i forgot to include that. Yes, we do. It's a GE Cafe. I'd give it 3 stars - cleans well and we run it a lot but the automatic dishwashing liquid dispenser feature (the one where you just pour the whole bottle in and don't have to put in more liquid each cycle) broke a few years ago. Still works fine with the regular dispenser option. A little loud but nothing I find too disruptive.